IN 2012, vibraphonist Jim Hart’s Cloudmakers Trio featured renowned Californian trumpeter Ralph Alessi on their inaugural tour – and the recorded live set from the Pizza Express date, subsequently identified for album release (Live in London), won many plaudits across the contemporary jazz fraternity for both the quality and immediacy of the performances. 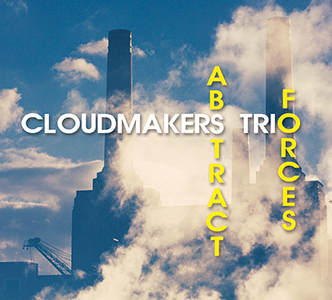 Their much-anticipated second release, Abstract Forces – a studio album of seven extended new Hart compositions for trio only – now builds on this ensemble’s strongly improvisational ethos (the band name stemming from the analogy of a power station or engine room creating ever-changing, cloud-like abstractions). And, with the driving bass of Michael Janisch and trademark drumming vigour of Dave Smith, Cloudmakers continues to produce inventive, oblique, tricksy-but-accessible grooves. On the back of the live album, the absence of an out-front lead instrument might have left this line-up seeming somewhat lacklustre… but the key to success here is very much the chemistry between these three collaborative minds (who have worked together for many years), intuitively brewing up their own ingenious brand of ‘cumulonimbus’ clout. Janisch’s thrummed bass sets up the bristling momentum of Snaggletooth, Jim Hart extemporising colourfully and broadly with mallets and bows – and immediately the high energy of the trio can be grasped. Hart’s assuredness at the vibes is breathtaking, whether soloing rapidly or pushing the pulse with chordal clusters, including judicious use of electronics. Angular Momentum races to impossibly-complex written time signatures, yet the three players remain remarkably synced throughout (#jawdrop), Smith hustling and bouncing magnificently. Great explorations characterise Post Stone, Hart’s free electro-distorted hammers and celestial bowings ringing to the busyness of bass and drums, and then breaking loose into ‘ordered delirium’. Michael Janisch’s solo bass is both lithe and attractive, teasing out chords, harmonics and trills – and, appropriately, it introduces melodious Early Hours, Hart’s compositional prowess here leaning more towards the Bachian mystery of John Lewis’s writing for the Modern Jazz Quartet (Hart also features in The MJQ Celebration – reviewed). The playing here displays delightful luminosity, sustained vibes balanced delicately with the lightness of bass and drums. Social Assassin swings out to Janisch’s bass chords, Smith hitting the kit solidly, Hart roaming freely; and Ramprasad conjures a little more of that Milt Jackson magic, Hart and Janisch sharing its inquisitive melody before electronics coax ethereal bell chimes and drones from the vibes. Finally, Conversation Killer fizzes with Phronesis-like bass impetus, Smith thrashing in tandem with Hart’s persistent Steve Reich-ian rhythms. There is never a sense that this is ‘easy listening’ or ‘background’ jazz (piped lounge bar muzak of the late ’60s and early ’70s never did the vibraphone any favours!). Instead, Cloudmakers offer intelligently crafted music, in terms of composition and synergetic execution, which demands close scrutiny to understand its many details and nuances – a real tour de force. Released on 29 September 2014, check out the Abstract Forces album page at Whirlwind for promo video, audio samples and purchasing – tour dates below – as well as the Live in London album page.